In August 2013, 16-year-old Jordan Boyd passed away after collapsing on the ice at the Acadie-Bathurst Titan hockey training camp. It was later determined that Jordan had an undiagnosed heart condition known as Arrhythmogenic Right Ventricular Cardiomyopathy, or ARVC. As the anniversary of Jordan’s passing approached, his family decided to host a hockey tournament in his honour, hoping to also raise funds and awareness for ARVC. Public interest in the event quickly spiked after NHL celebrities, such as Brad Marchand, spearheaded the event. 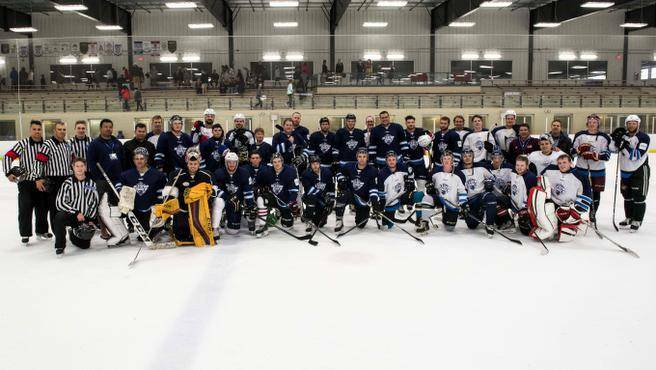 As a result, the first annual Jordan Boyd Celebrity Hockey Challenge raised $100,000. Since then, the yearly event has continued to grow and to date, the tournaments have generated more than $560,000 net in support of inherited heart disease research at the QEII. “We had no idea that Jordan’s story could impact and motivate so many people to fundraise for such a good cause,” says Greg Dobson, Jordan’s brother. Dr. Martin Gardner with the QEII's Inherited Heart Disease Clinic is particularly pleased by the increased public awareness the tournament continues to generate. Because Nova Scotia has the second highest incidence of ARVC in the country, and because the disease is so stealthy in nature, Dr. Gardner insists that knowledge and vigilance are critical. “It’s genetic, so if it's found in a family member, all the family members need to be checked,” he says. Jordan’s family was no exception. “We uncovered that I had the gene and my mom has the condition as well,” Greg says. For Dr. Gardner, the funding provided by the tournament has allowed the clinic to hire additional staff, participate in regional and national studies and it has provided the funds for genetic counsellors and research nurses to travel and share best practices regarding ARVC. This synergy has led to several key insights into the diagnosis, treatment and care of ARVC, particularly in the past four years. The Canadian National ARVC registry, hosted at the QEII, is the largest in Canada and also holds tremendous potential. According to Dr. Gardner, the more people make themselves available for care and research, the more effective detection and treatment will become. As for Jordan's family, they are encouraged by the enduring and varied impact that Jordan’s legacy continues to provide.